No lists (except for this one). I’m typing these words in advance in order to fill the Weekly Tips hopper before going off the work-related grid. And as I’m writing, it occurs to me that there’s wisdom for us all in the Ovid quote (which is also the inspiration for my out of office message for the month). As much as I’m committed to excellence and mastery and “raising the bar” and all that when it comes to relationship-building—and I think you have to be if you want to be a no-kidding trusted advisor—I think we all need to take a rest now and then. That means letting go of the striving and endeavoring to instead just focus on breathing and being. 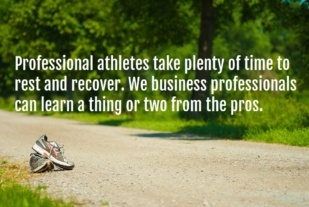 Professional athletes take plenty of time to rest and recover. Why shouldn’t we?